Borrego Double Century is included in the prestigious California Triple Crown Series. Mountain High Cycling was designed to show-off the best cycling areas in Southern California. The Borrego Double Century starts in the small desert town of Anza Borrego Springs, north east of San Diego. You'll be climbing in the cool of pre-dawn with a billion, billion stars, overhead. The camping is delightful, if you choose to. There are no fast-food restaurants or chain stores here. Borrego has no traffic lights! Great Mexican & Italian food though! Infact, you won't see a traffic light for about 80 miles. The ride starts at Christmas Tree Circle, a round-about & city park, in the center of town and travels west for about 3 miles towards the awesome Montezuma Grade, an 11 mile pass that gradually takes you up out of the desert and into the mountains. From the summit, you will soar down towards and around Lake Henshaw. Just past Henshaw store, R.S.2, you'll turn right and head up the east grade of Mt. Palomar, 14 miles, of a gentle mtn. grade, to the only store up there, and R.S. 23, the Fruit Smoothie Stop. From here, you'll turn around and head down the south grade, back to hwy. 76 and on down the down to Valley Center Rd. for a left turn headed south towards the town of Valley Center, following backroads towards Oceanside, for lunch on the beach. Heading south along Oceanside you'll ride through Carlsbad, Vista, and up Ramona grade to the quaint western town of Ramona. Old Julian Hwy will take you up to Santa Ysabel for Julian Apple Pie, a la mode, unless it's late enough for chicken & veg. soup. The last major climb takes you up to Julian, and is not steep, at about a 4% avg. except the first mile is 6%. 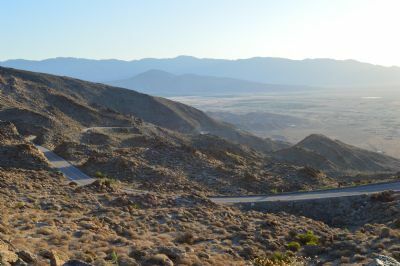 At the end of Julian you begin a wonderful 17 mile descent back out to the desert, which by now, has cooled down, with the sun setting or even dark with a billion, billion stars! A left turn will take you up the two mile Yaki Pass, always with a tail wind, then you're soaingr down the pass, you'll see Borrego off to your left in the distance, quiet...unitl you turn left at the bottom, and diagonal over to a not-fun two mile headwind, which finally curves north. It's a straight shot for two miles to Christmas Tree Circle, The End! The air will be sweet, the stars will twinkle, and the Palm Trees will welcome you with open arms. 16,000 ft, 192 miles, Congratulations! You have made yourself a Borrego Double Century, California Triple Crown Winner! Route sheet made available to Registered Riders, Volunteers, and email request only. Garmin ready route available to Registered Riders only. Post-ride meal at Ride Host motel afterwards. Pictures at Ride Start, up Montezuma Grade, up Palomar, and Ride Finish will be on Facebook. Ride is timed. Will the tandem get 1st place again this year?! See YOU in BORREGO, JULY 21ST!